Oh TWIST Home - Discover what could be making you so tired too! Ehlers-Danlos Syndrome, Mast Cell Activation Diseases and Dysautonomia – Oh! That’s Why I‘m So Tired!! And maybe that’s why you’re tired too… join me on a journey of discovery about one of the most poorly recognized and unbelievably tangled health webs you can find… involving not just one, but several intertwined systemic conditions I personally unofficially call the “Chronic Constellation” for lack of a better name that are each alone enough to take a person down at the knees, but combined, can be downright show stopping, if not even lethal sometimes, sadly. Most are currently getting diagnosed with Fibromyalgia or ME/CFS, if anything at all. This site is my attempt to help remedy that for everyone – both patients AND doctors! Hypermobility Spectrum Disorders aren’t rare, they’re rarely diagnosed! And most autistics I know (on or offline) would prefer we renamed it “Autism Acceptance Month“. They’d much rather we stop trying to scare everyone away from it, nor seek to prevent or cure it, but rather, to understand, respect and support it as just a different way of being than the majority “norm”. They feel strongly this stands for efforts to erase, eradicate and even prevent their existence. And you can kind of see their point: what if people set about trying to prevent your existence? They humbly request we say “nothing about us without us”, and I must say I agree now. I’ve been infantilized and erased and ignored enough myself, despite not being diagnosed that I can relate a bit now. And I’m highly verbal. Some non-verbals who are just beginning to get published on social media and more are surprising their parents in a big way with how much they know and grasp, but just can’t easily express for many reasons, often physical, and not intellectual. Ideally, if we all shift FROM the medical model of recent history TO a more social model, seeking to include and support autistic people,we could go a long way to increasing peace and harmony for everyone. Including harried and stressed parents who are being told and sold a bill of medical goods to “cure” their child. Can parents use more support so they don’t feel so eager to erase autism? Absolutely. Especially those with non-verbal kids who they are struggling to communicate with. But that is not the same as saying your child should not have been born, or needs “fixing” so as to think like you or anyone else. I hope you’ll join me in going against the tide and slowly but steadily recognizing and rooting this ableism out for everyone’s benefit. They will be launching the debut of a new “Project EDS ECHO” in April 2019, a platform intended for ALL doctors and medical practitioners to use to collaborate and “cuss and discuss” (my words) EDS and the HSDs in the clinical setting. I.e, present cases, share tips and tricks AS PROVIDERS. So this is not for patients, sorry (unless you also happen to be a provider as I know some are). But this should go a long way to helping ease the burden on patients to bring their clinicians up to speed. It’s a two-way platform, not meant to just be “presentation only”, but foster true two-way dialog among all who attend each week. It will be free to doctors, and CMEs will be available. Learn more here! And share with your doctors! All of my current content will still be available for free, and all of my blog posts will ultimately be free, but they may be available first to my paying supporters, then later to non-paying viewers after a suitable interval. I care too much about getting the word out/supporting this community to put it behind a paywall! Especially since many of you are disabled to varying degrees as well. But in case you’re not, or you’re a doctor or other medical practitioner who’s benefiting from my site, I truly welcome your support here now TY! Regardless, I have put in hundreds of hours on this site, and on Facebook and Twitter, working to bring you all the latest, greatest and most reliable information in the field at all times. This has been all out of my own very meager pocket on disability. Which now only pays my rent, so… I could really use your help staying fed and watered too! Checks may be sent to Jan Groh, PO Box 86824, Portland, OR 97286 too. 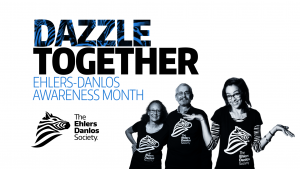 May was Ehlers-Danlos Syndromes Awareness month and boy did we have some updating to do in 2017! Thanks to the brand new 2017 EDS nosology and diagnostic criteria published March 15th, 2017 there were 7 new rare types to know about (making a total of 13, up from 6 before), and they tightened the criteria for the most common form, hypermobile EDS making it (technically) rare again. UPDATE 4/10/18: There’s a new 14th type out now too. 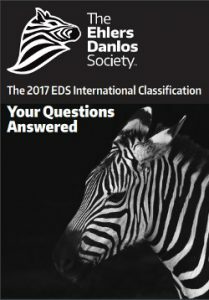 ALL 18 PAPERS covering all aspects of the NEW Ehlers-Danlos Syndrome revised nosology and diagnostic criteria are here now. For those unaware, this is the FIRST update since the Villefranche nosology was presented in 1997 (over 20 years before! ), and this also supplants and replaces the Brighton Diagnostic Criteria for Joint Hypermobility Syndrome which some also used to diagnose hypermobile type EDS also. So there will at least be no more confusion between Brighton and Beighton going forward, even if many of us no longer count as bendy! Update May 2018 – The Royal College of General Practitioners in London, England just successfully rolled out a brand new, brilliant “EDS Toolkit“ for their GPs to learn and study from! And I got to help draft it at the invitation of the primary author, Dr. Emma Reinhold, a GP with hEDS and MCAS herself I met on Twitter along with some other much esteemed company. I’m very pleased to have played even a small part in “midwifing” this project along. Please share it far and wide with any and all doctors you can! It is freely available to anyone and everyone on the web, not just the NHS. 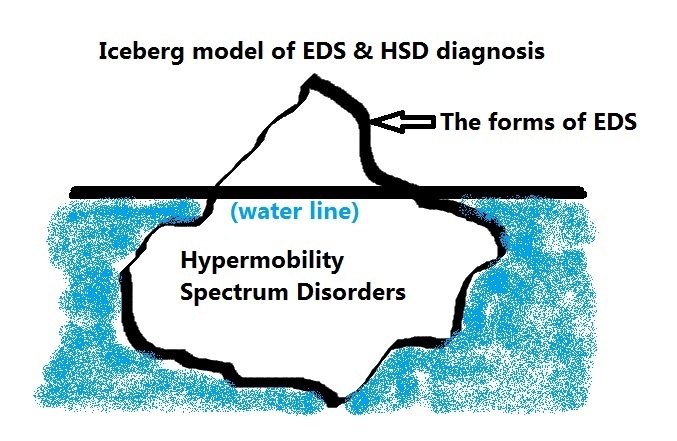 As well as diagnosing an entirely new category of several Hypermobility Spectrum Disorders for those who look a lot like they have EDS, suffer much the same, but don’t meet the criteria for any more specific diagnoses involving hypermobility of varying degrees yet. I.e, they are subclinical for hEDS as I was for my first 44 years, and may now be technically again since I stiffened so much with age and arthritis. Kind of like how Pluto was re-classified to a dwarf planet 10 years ago right? It never changed a spot. NB you do NOT need to “lose” your diagnosis of hEDS until/unless someone requires you to, such as to meet the criteria for a research study. Further, you will still have a diagnosis that represents a hypermobile disorder, but just with a different name. It is hoped this will lead to speedier presumptive care and management rather than just leaving patients suffering because they did not meet the new higher bar of hEDS diagnosis. I, Jan, unscientifically personally now feel very strongly that the newly recognized Hypermobility Spectrum Disorders as such are NOT rare at all, but also just rarely diagnosed – and not just because they are newly introduced. But because they’ve always been dismissed as “normal” or early aging, or “just depression”, fibromyalgia, chronic fatigue or hypochondria under any name/classification scheme when they should not be! It is my deepest wish that one day, this disease cluster will be as well known as multiple sclerosis, and much more quickly recognized. Everyone knows someone with a hypermobility spectrum disorder, if not even EDS. I will continue to post and tweet to that end, while I finish writing my book. Join me. Yes, I was part of this study. No idea if I had elevated tryptase or not in the blood I sent, but I highly doubt it. So the $64K Q for me is: do I have this mutation? I also don’t know – yet. (Update April 2018: Just learned there’s now a commercial DNA test available to check for it, link above.) That said, I’m already managing the conditions (plural) pretty well already, so I’ve got that bit handled, which is my main goal. (Everyone else can split hairs and fight over how to classify and recognize and validate us while I continue rebuilding myself TYVM.) Still, nice to see the fruits of his labor help move the ball a little bit down the field. And maybe make it easy to diagnose another small subset of the hEDS population with familial “tryptasemia” as he calls it. See his earlier recent update videos on my resources page. I can use your financial support at any level to help keep this blog online here thank you.